Item is a 35mm, single lens reflex camera manufactured by the Zeiss Ikon Company. 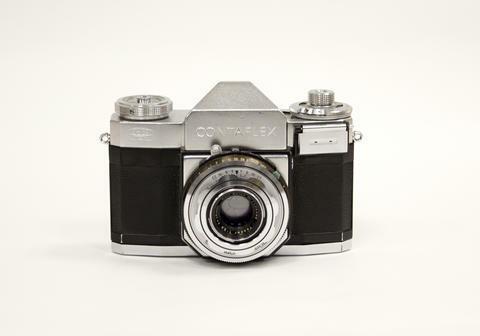 This model, introduced in 1954, has a Tessar 45mm f2.8 lens and synchro-compur leaf shutter. The camera has a built-in, uncoupled selenium exposure meter and a telephoto lens attachment that slides over the original lens (Teleskop 1.7 x NR 2507248). Donated to Wilfrid Laurier University by Ann Weibe.